•	Ripley's Believe It Or Not! The savings begin with a 15% discount when you purchase tickets to two separate attractions. Buy tickets to three attractions and the savings increases to 20%. Each additional attraction adds another 5% discount up to the maximum savings of 35% on six or more attractions. You may purchase your tickets online or in person. All tickets must be purchased at the same time, and in similar quantities, to receive the full discount. You may order your tickets online before your visit – allow at least three days for processing. Your tickets will be available at the Tommy Bartlett Show ticket office will-call window starting at 9 a.m. daily. 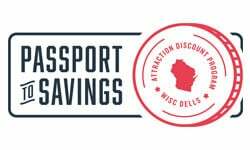 You may purchase attraction tickets in person at any one of six convenient ticket booths in the Dells area. The Tommy Bartlett Exploratory ticket booth is open year-round. During the summer season, between Memorial Day weekend and Labor Day weekend, you may also purchase tickets at seasonal ticket booths located around town. Look for the booths at the Tommy Bartlett Show, Wilderness Resort, or Pirate's Cove Adventure Golf. There are also booths in downtown Wisconsin Dells at the intersections of Superior Street and Broadway, and at Oak Street and Broadway.